After much Googling, more about I’ve finally found a CSA that I think I’ll like and that I don’t have to drive 30 miles to get to. Because it’s too hot and a little backward down here, our season is actually November – April, but you can order tropical fruits, eggs, avocados and fresh herbs during the summer. So, Saturday morning I picked up my delicious, multi-colored eggs, fresh lemongrass, curry leaves, mint leaves, raw honey and just about the biggest avocados I’ve ever seen. I kid you not – these guys are at least 18 inches long and twice the width of a softball. I can’t wait for them to ripen! So, what does any of this have to do with rice? Not much, really. But I thought it was a nice story and I did use the fresh mint in this unusual side dish. Rice is usually boring – a base for the more interesting things it’s served with – Green Curry, Ropa Vieja or Sushi. 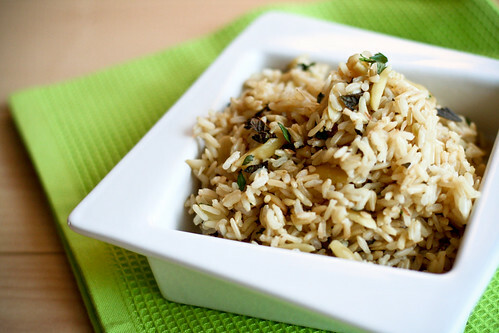 But rice can be dressed up and made into a side dish that’s as good as the main. I grilled some local lobsters with lemongrass and curry leaf butter and wanted a rice dish that stood up to the lobster and paid its respects. I toasted some unsweetened coconut and slivered almonds then tossed them into the rice cooker with chicken stock and brown Jasmine rice. Stir in mint and cilantro and you have an exotic rice that pairs perfectly with grilled anything (and especially lobster). This is no sad side of rice – it’s jubilant and addictive and i can’t wait to make it again. Place a large skillet over medium-high heat and add the almonds, stirring constantly. When the almonds become slightly fragrant and just begin to brown, add the coconut. Toast until the coconut begins to brown, then remove from heat to a bowl. Add the coconut, almonds, rice and stock to your rice cooker and cook according to directions. If you don’t have a rice cooker, place the ingredients in a medium-sized saucepan and bring to a slow boil, cover and reduce the heat to low. Cook for 40 minutes, or until the rice is tender and fluffy. Remove from heat and stir in the cilantro and mint. Taste and add salt if necessary. mmmm… looks great Mel! I’ll have to try it with some fish. Out of curiosity, which CSA are you subscribed to? I’m running one through People’s Grocery here in Oakland. I love it b/c that means I get to try the fresh produce each week too! this recipe sounds delicious. i wouldn’t think to put toasted coconut in rice but definitely gonna give this a go! Mel, what kind of camera do you use? I am always so taken by your visual representations. I’m on the waiting list for the Bee Haven Farms CSA down in Homestead, FL. Since the season hasn’t started yet, I’ve just bought some of their summer fruit, eggs and honey and so far I love it! C – I have a 4-year old Canon Rebel with this 50mm lens. It’s not too pricey and I love it.